I would like to set VLC media player as the default player in my Samsung desktop with Windows 7. How can I do that? How to make another video player as my default video player in Windows? 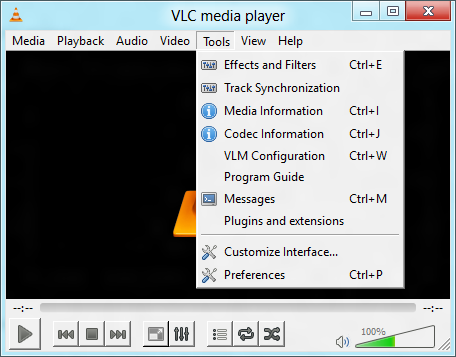 VLC media player is very good media player,you can also customise it to have a great interface. 3)then select vlc media player. Vlc media player has become default player for that type of file. 3)here you will get the list of all types of files installed on your computer. 5)click on change program present on the upper right corner. Click on Tools in menu and in the flow down window that appears select Preferences. Click on the Interface button on left panel and then click on Set up associations. Check the box next to select all. Now all media files will open in vlc player when you double click on it. hiiii...here is the steps to make vlc as default media player..
2-Press Ctrl+P or click Tools→Preferences. 3-Click Association Setup.It is an important step.Select formats in your faver, then click Apply. The change of file association will take effect when click Save. Dear,You can set the VLC in default Mode by following steps. 1. Click on any of the media file 2. Right click on the File 3. Click on the Open With Option 4. Click on the option Select the program from of the List5. Click on the VLC from the List of softwares 6. Click on the option " Always play this Type of Programe in this Player"7. Click on the OK button. 1.Open VLC player,click on Tools in menu,select Preferences. 3.Now select types of files from the list that appears,and anyone need to use with VLC player as default,"select all"
4.Now you can set VLC media player as default player in wndows7. Now you default program is changed to VLC player. 1.Right-click on any media(video or audio) file and click open with. 2. In open with, click choose default program. 3. In Recommended Programs, click VLC media player. 4. Tick on Always use the selected program to open this kind of file. VLC is now your default media player. from the list of programs select VLC and check the check box below as shown in the above image. Then it will associate the format with the VLC media player. IF you want to open it in another player the uncheck the box since checking the box will associate the format with other program. VLC is the best free video player available which supports most of the video or audio file fromats. Well this is easy you see. Whenever you open up a file there are two options in your hand. One is that you double click it and play directly. The other is that you right click with your mouse on that file and go to open with... option. There you will have Choose Program option. When you directly open the file then you have no other option but to view it the default way that is provided to you. But when you choose open with and then Choose Program option then you will have other options to open that file. Just you will have to select the option of Select the program and you get to selecting the type of program which will open your file. If it is a media file then you will have other options also like Quick Time, VLC, Winamp, Real Player etc., depending on what all you have loaded in your machine. Now in your case you want it to be VLC always. Just select VLC from the corresponding browsing dialog box opens in front of you. If you select OK and get out of the dialog box with this settings, then every time you open such files you will have to go back to open with and then change the settings. But if you tick the check box saying, Always use the selected program... and then the next time you need not worry about this types of files at all. By default it will open through VLC Players. If you want to setup a VLC player . Then go to search engine and search VLC software downloadable sites. There is many downloadable sites it will provide you. download it and install it . In installation choose "shortcuts in desktop" for shortcuts. Then after use it . Now vlc is the default media player in your pc..
Click on the Interface button on left panel and then click on Set up associations... (it's close to the bottom). Select types of files from the list that appears, and anyone need to use with VLC player as default, or "select all"
3.In the search box type 'Default Program'. 4.in default program click on 'Associate a file type or protocol with a program'. 6.select VLC media player and click OK. Setting VLC media player as default player in Samsung Desktop with Windows 7 is a very easy process. --> Go to " Start Menu "
--> Then click on " Control Panel "
--> Then from the list select " VLC Media player "
Thus you can make VLC Media player as Default Player in Samsung Desktop with windows 7. 1.Firstly install the 'VLC Player' in your computer. 2.Then you go to the 'My Computer'. 3.Later you go to the drive in which the video files are present. 4.Then select all the files in the drive. 5.Then make a right click on it and click on 'Properties'. 6.There in the 'general' tab click on 'Change'. 7.There you select the VLC player. 8.At last click 'Apply' and then 'OK'. >> Open Control Panel from the Start Menu. >> Now, click on Default Programs from the dialog box. >> Here, click on "Set your Default Programs"
>> Choose VLC Media Player from the left pane, and choose "Set this program as default". >> Than Click On The Set This Program As Default. >> Than VLC Work As Default Player. 1. Open The Control Panel, Click On The Start Menu And Open The Control Panel. 2. Than Click On The Default Program Option In Control Panel. 5. After The Click On The Set This Program As Default Option And Make The VLC Media Player As Default Player. 4. Click on "Open with"
5. In further menu of "open with"
6. Click on Choose "default program"
8. Put check mark on "always use selected program"
7. 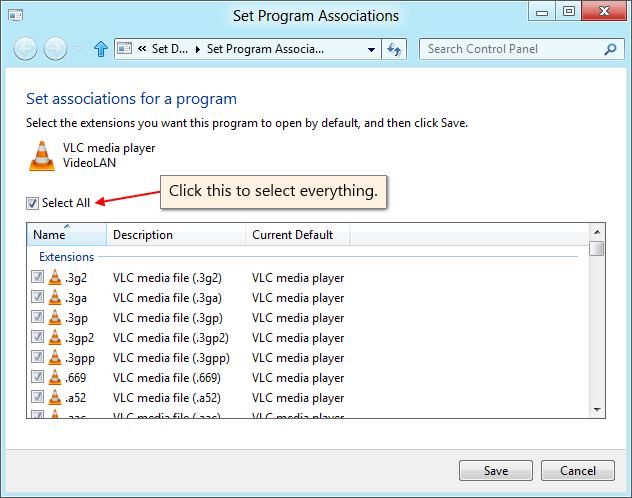 Put check mark in "always use selected program"
Setting up VLC Player is easy and can be done following the processes. Right click on any multi-media file , select "open with" > choose default program, select vlc media player as the default player. Vlc media player has become default player for that type of media file. You will get the "list of all types of files installed on your computer". click "change program" present on the upper right corner. Hope that will do the trick. The following is the procedure for solving the problem of setting VLC media player as default player in Samsung desktop with Windows 7. At first you have to go to the startup menu. Now in the bar of search,you need to write the default. There you can press the default program option. After that the option of 'set your default programs' is to be tapped. Then the screen shows you the programs list which is present in the left side of the window. Now from the list,the option of VLC media player is to be selected. After that you can press the option of 'set this program as default' which is present in the right side of the window. 3rd-----)here you will get the list of all types of files installed on your computer. 5th-----)click on change program present on the upper right corner. Hi friend, just follow these steps:1. Click on Start followed by control-panel and after that choose default programs2. Click on set association icon 3. Now, to change the default program,click on file and then click on change program present on the upper right corner.its done, hope I helped. >>click on "set your default program"
>>single click on "VLC media Player"
>>Now VLC player is set as your default program. Right click on any multi-media file , select "open with"
> choose default program, select vlc media player as the default player. you can do this in two methods one is while installing VLC and the other is after installing VLC. While installing VLC you can mark it as default media player. After installing VLC also you can do this..
now click on set up associations. check the "select all" button. from now onwards all the media in your system will be played in VLC..
here you will get the list of all types of files installed on your computer. click on change program present on the upper right corner. You have to change the property of the default program for the video file .. Right click on any vidoe . Click on Change button in type of file area . Right click on any of the media file . If you select Open with then select the program as VLC Media player . tick on the check box below , Always perform the same action . that's it you are done with the job . Now incase if you select Properties then click on Change Radio button . Select VLC Media player . finally save the changes and apply them . **Regarding this problem***press windows icon in your system..*choose control panel, *and select open all control panel items..*select default program menu..*choose set your default program..*it display what all the application are already installed..*then choose VLC PLAYER..*and select the "set this program as default"..*and click OK..it CHANGE VLC PLAYER is default PLAYER is your system..thanks..
Firstly go to any audio or video file. Then Right click on it. Then select Choose default program and click on VLC player. Save the changes and press OK.
1. First of all open vlc player. 2. Then go to the option saying Tools. 3. After that click on the option saying Preferences. 4. Then click on the option saying Video. 5. And then you should chose all files from there and check mark in the boxes provided there. That's it and from now on every file will be opened by VLC player on your computer. For this Go to Start button..
Next click on Set your default program..
Klite codec conflict with media player? How to get mini player toolbar in Windows Media Player 10 using windows XP professional?